The Relia-Bolt is coated with Electroless Nickel-Teflon NP3 PLUS. 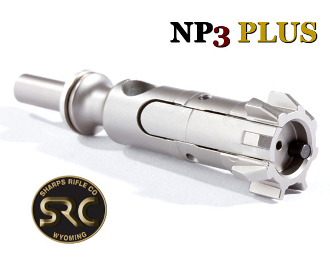 NP3 PLUS has up to 5x more corrosion resistance over standard NP3. NP3 PLUS has up to 10x more corrosion resitance over regular electroless nickel. The Relia-bolt is MPI, HPT, (Magnetic Particle Inspected and High Pressure Tested) and Shot-Peened. The Relia-Bolt fits rifles in 5.56/223/300BLK and 25-45 Sharps calibers. The redesigned lugs of the Relia-Bolt™ virtually eliminate the most common MSR malfunction; the bolt to barrel extension jam. Haven’t cleaned your rifle? Is it out of time? Relia-Bolt compensates by providing a patented camming action which guides the bolt past obstructions. The rounded/tapered lugs push past carbon and debris when the square edges of traditional bolts would typically jam. The rear edges of the lugs fully engage the barrel extension for absolute strength and security. The Relia-Bolt is machined from S7 tool steel and tempered with SRC’s proprietary heat-treating process, significantly increasing strength when compared to Carpenter 158 steel. S7 provides a 75% increase in tensile strength, and nearly 60% improvement in yield strength. Every Relia-Bolt is coated with NP3 PLUS, an electroless nickel-based finish. This process co-deposits sub-micron particles of PTFE (polytetrafluoroethylene), commonly known as Teflon, for self-lubricating corrosion resistance. NP3 PLUS offers far more corrosion resistance for marine and other hostile environments. NP3 PLUS gains up to five times as much corrosion resistance over standard NP3 and up to 10 times more than regular electroless nickel! The Relia-Bolt is drop-in compatible with all existing AR variant parts groups and bolt carriers; no modifications or tools are necessary for installation. Magnetic Particle Inspected, High Pressure Tested, and Shot Peened, the Relia-Bolt is guaranteed to perform under pressure. If any Relia-Bolt is found to have defects in materials or workmanship, SRC will repair or replace it at no charge. You do not need to be the original owner, and no time limit applies.